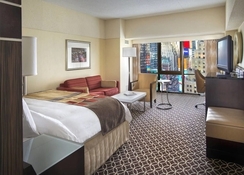 The Marriott Marquis NYC Hotel offers accommodations with spectacular views of the pulsating Times Square. 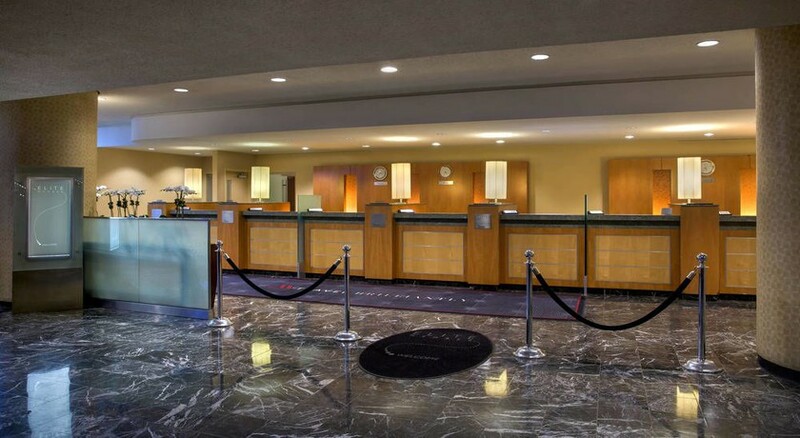 It has spacious and soundproofed rooms, Wi-Fi connection, cable TV, air conditioning, large beds, a desk, in some cases a seating area and a bathroom complete with marble. In the 49-story building, there is also a gym with fitness machines and three restaurants (The View, a revolving lounge with gazebo), the Broadway Lounge (serving cocktails and light snacks) and the Crossroads American Kitchen Bar, with American cuisine, and 55 meeting rooms adaptable to celebrate any event. Its central location allows visitors to visit such famous places as Central Park, Madison Square Garden and Radio City Music Hall. 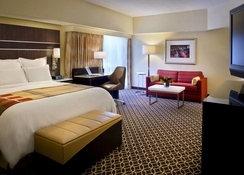 The Marriott Marquis NYC Hotel is located on Seventh Avenue, next to Times Square. Nearby are Madison Square Garden, the Empire State Building, the green lung of Central Park and the Statue of Liberty. LaGuardia International Airport is about 15km, while the John F. Kennedy International Airport is about 28km. This spectacular hotel has over 2000 rooms spread over 49 floors. 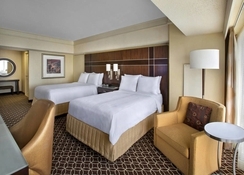 Guests can choose between luxury, superior, premier, suite and room level concierge. The deluxe rooms have 39 square meters of floor space, large soundproof windows, air conditioning equipment, a king size bed with feather mattress, a sofa bed, desk, flat screen TV, cable channels, radio, internet connection and full bathroom. 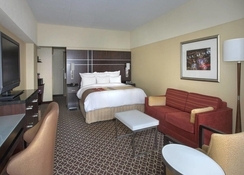 Superior rooms have more space and views of Times Square. The premier rooms have 41 square meters of surface, carpeted floors, spaces for bedroom and living area and are located in the quietest part of the hotel. The deluxe double suites offer 51 square meters of floor space, a separate living room, carpeted floors, two large double beds, three telephones, a sofa bed, a safe, a desk, two flat-screen TVs and cable channels. In the gastronomic section, Marriott Marquis NYC offers The View Restaurant Lounge, a spectacular rotating lounge located on the roof with views of the Broadway lounge, the Crossroads American Kitchen Bar and a nearby Starbucks. 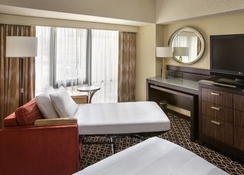 Marriott Marquis NYC caters to its guests 24 hours and provides room services, tourist information, food & beverage vending machines, express check-in and check-out, luggage storage, safety deposit box, laundry, concierge, shoeshine, babysitting, alarm clock and currency exchange. The building also has a full gym with cardio and bodybuilding equipment and views of neighbouring skyscrapers as well as up to 55 meeting rooms and a business centre with specialised staff. The accesses are adapted for people with reduced mobility.